After our garden audit we’re gearing up to make more use of our outdoor space now the summer is on the way. 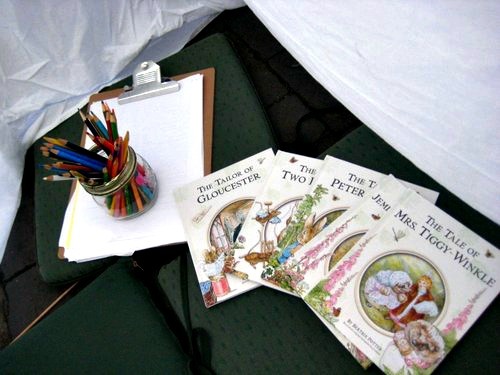 Here are five quick and easy ideas we’re using to take our literacy outside. 1. 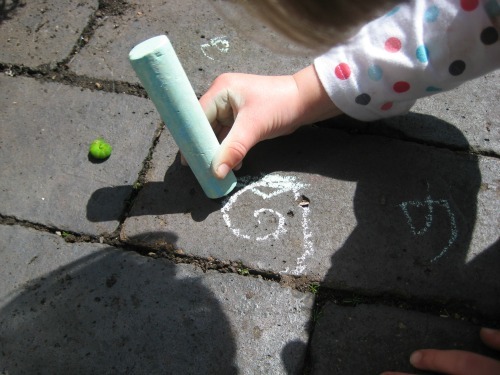 Go inside out: I bet you have plenty of writing materials in your inside playspace but how easy is it for the children to get their hands on things to make their mark when they’re outside? Where could you set up a writing station in the garden? A tub of you pencils on a picnic table. An easel in the shade of a tree. A roll of paper fastened against a wall. Pretty much any way you promote writing inside works out of doors too. 2. Paint a blackboard: A pot of blackboard paint is a worthwhile investment and can transform a plain old garden gate or shed door into a place children can make their mark. You could start them off by drawing a tree trunk or some flower stems and seeing what pictures they add. Or make it an observation station and ask the kids to draw some of the bugs and butterflies they spot around the garden. Chalk works just as well on walls or the floor of course, and is easily washed away with rain or watering cans, leaving a fresh canvas for the next day’s drawings. 3. Plain old water: One activity I remember from my own childhood, and which my kids love too, is painting with a bucket of water and a paintbrush on the patio floor. Using paint pots with lids helps to avoid spills and providing paint brushes in an assortment of sizes, including big decorators paint brushes, invites different styles of drawing and writing. 4. Clipboards: A practical way to promote literacy outside is to have a stash of clipboards and pencils piled up near the door, ready for action. The boards provide a sturdy base for writing and so are easily taken out and about in the garden, to the beach, the woods or wherever you’re playing outside. No Time for Flashcards has a great DIY travel clipboard you could make. 5. Story tents: As you’ll be thinking of providing somewhere shady for the children to keep cool, why not transform your shelter into a story tent? Add some big cushions for lounging on and a pile of books. Choose some great outdoor themed stories and also information books on plants and animals, so the young scientists can read up on the nature they observe outside. I need to take out JDaniel’s tent and read him stories in it. 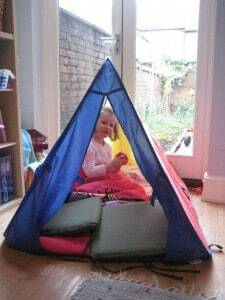 Hi JDaniel4’s Mom – I think it’s so cosy to make a story tent. You could invite some teds along too. Some great ideas here. I love to do learning things in the garden when the weather is good. Gets us all out in the fresh air and a bonus to do learning tasks too as it feels more like playing than learning. What great ideas. We are in GA where soil is hard to find but sand is everywhere. Our son loves to just write in the sand with a stick. 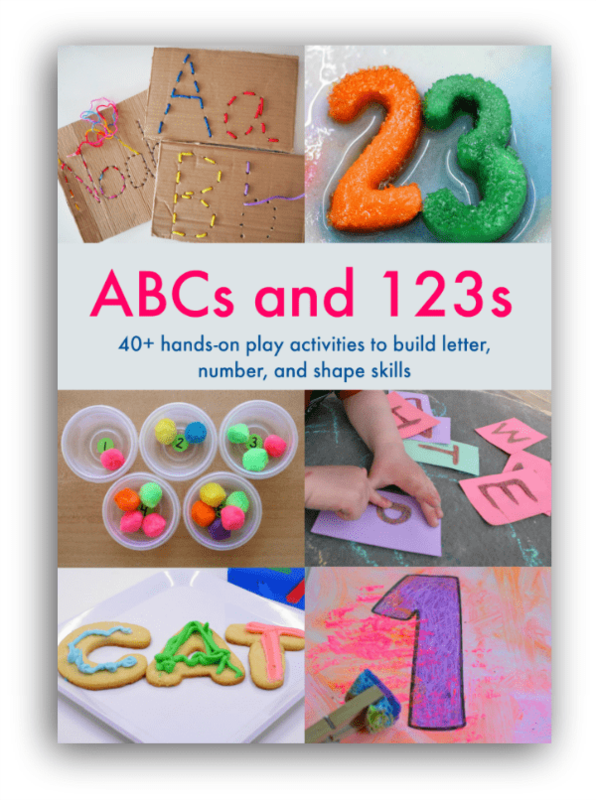 His letters, numbers, and even solve math problems this way. My daughter a bit older(and considers herself a scientist) finds ant hills or some other thing in nature that tickles her fancy and journals them every day. I have found the key to literacy is to find a subject your child likes and give them books to read on it and reasons to write about it. Great ideas! I encourage my kids to read and write in their journals on our patio. I love writing on a clipboard as an adult!! Debbie – I’ve been thinking this week about ‘borrowing’ one of the kids’ ones for myself!! great reminders! I forgot about clipboards — now to find where I put them. I don’t think any one blog post can do justice to the potential of literacy outside. One of the key points has to be that the every changing seasons and natural events that engage children and encourage questions, curiosity, awe and wonder impact profoundly on children’s ability to talk and listen. Big play experiences that naturally lend themselves to cooperative activity also cannot be replicated indoors. This also enhances children’s communication skills which are a core part of early years literacy. 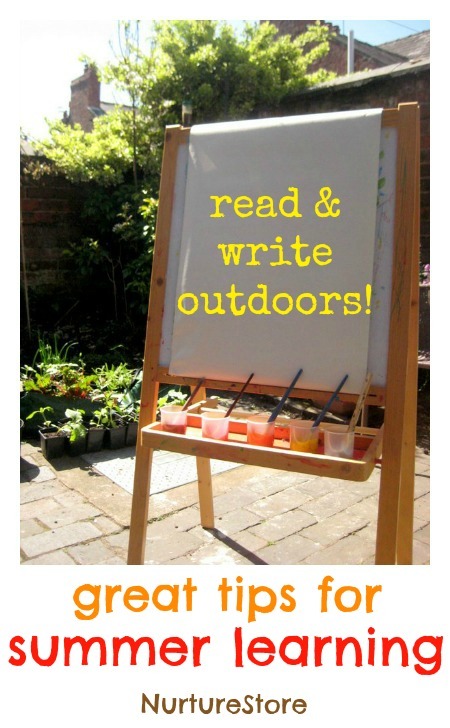 Please do feel free to have a look at any of the outdoor literacy posts on my blog http://creativestarlearning.blogspot.com/p/pre-school-info.html Your post has prompted me to get even more written! Thanks. We did lots of sidewalk chalk. My kids (4 and 2) have probably learned their letters the best this way. I think it is largely due to the pleasant outdoors!